President Rodrigo Duterte wrongly thinks that his war on drugs is his regime’s greatest strength and biggest source of political legitimacy. In reality, it is his biggest vulnerability and – unless he shifts course – could be his downfall. The collective grief and rage that followed another apparent extrajudicial killing is setting the stage for a wave of protests against the murderous war on drugs of the Duterte regime. To be sure, the public condemnation of the bloodshed and its endorsement by Duterte has been as persistent as the killings. But the indignation over the death of 17-year old Kian Lloyd delos Santos appears to be something different. The outrage is stronger and more felt than ever, and shared even by those who support the administration. Duterte has to listen – the killings must stop. The broad call today is against his war on drugs and its brutal and criminal methods. It is a call that is steadily expanding support and Kian’s cold blooded murder in the hands of the police is accelerating its growth. Failure to recognize this growing and legitimate demand could easily transform the broad call from one against his war on drugs to one that is against the Duterte presidency itself. There may be truth to Duterte’s claim that forces with vested interests have been plotting his ouster from day one. It could be the Central Intelligence Agency (CIA), the Liberal Party (LP), the drug lords, some generals in the armed forces, and they are all possibly working in cahoots with one another. But Duterte’s thuggish leadership is the biggest threat to his own presidency. 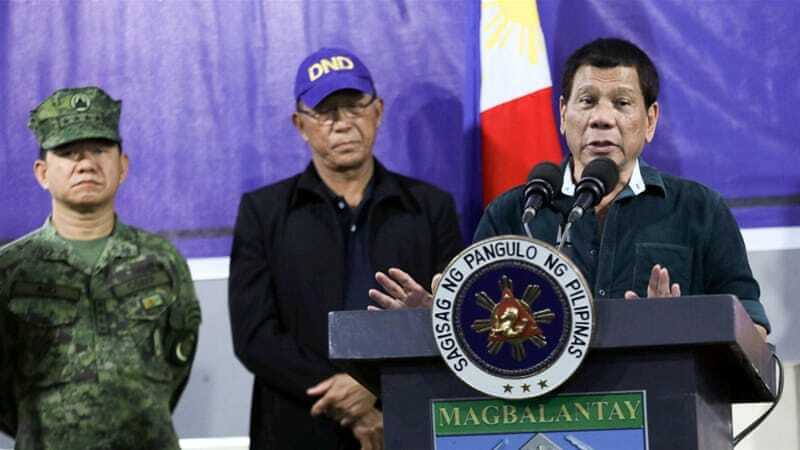 His fascism – the war on drugs; Martial Law; all-out war, bombings and militarization in the countryside – is creating the condition for a wide public sentiment unfavorable to his continued rule to consolidate and thrive. His high political capital could easily dissipate and resorting to more vicious violence and state terrorism would only spell his regime’s doom. His ouster would have legitimacy. It is not just the killings of overwhelmingly poor people – many of whom were innocent, including children as young as four and five years old – in his war on drugs. His regime is also continuously losing legitimacy in other areas of governance. Duterte allowed the trapos to kick out progressives and reformers from his Cabinet. He let the warmongers sabotage the peace efforts and kept on the bloody counterinsurgency campaign that targets civilians, especially the farmers and lumads. He did not lift a finger when his allies got involved in corruption or gross incompetence even as he persecuted his political foes. He let his economic managers further squeeze the poor dry while maintaining an economy that enriches the local oligarchs and foreign interests. But the murderous war on drugs is and will remain the biggest issue that could galvanize a broad movement – with Kian’s death among the key turning points in its formation – that will seriously challenge the Duterte regime. Those with self-serving agenda such as factions of the ruling elite that want to take over or get back to power – or foreign interests like the US which prefers a more reliable and predictable regime – will certainly exploit this. Unfortunately for Duterte, whether or not self-serving interests are at play, the movement for his ouster will enjoy legitimacy if he continues to cultivate the culture of impunity and to unleash his brutal wars against the people. It is up to the progressive and democratic forces that desire genuine change and social justice to thwart these narrow interests by decisively taking the lead in making the Duterte regime accountable for its crimes. The war on drugs should not be waged against the poor, which is what Duterte’s bloodstained campaign has become. They are actually victims themselves not just of drug syndicates but of the rotten social system that drives them into desperation and into criminal activities like small-time drug peddling. Even when dead bodies massively pile up, the poor will continue to risk life and limb for that next meal as long as the political and economic system that deprives them of decent living and the opportunity to be productive persists. Worse, as poor communities are transformed into war zones, even innocent lives become fair game.